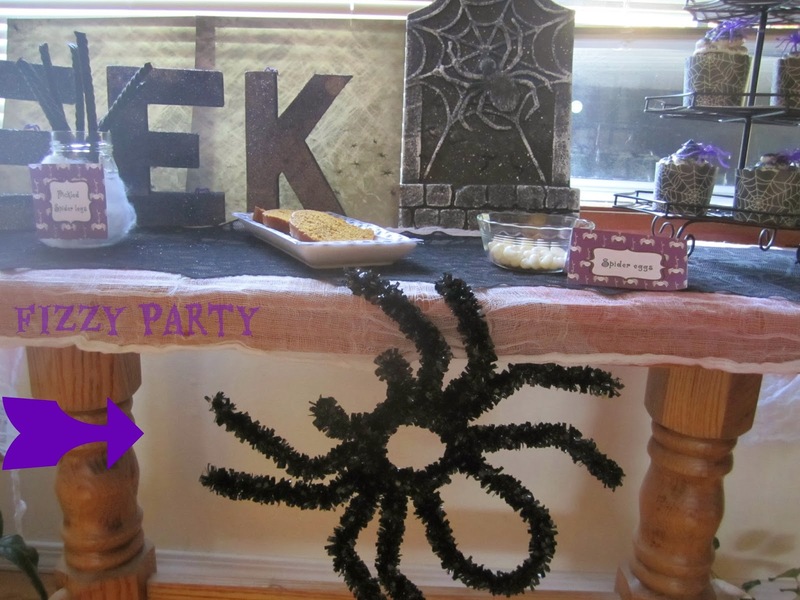 This is where I let you in on what was going on in my mind for my mini Spider Luncheon with my friends. All the things that are missing, didn't happen or didn't turn out how I wanted. Would you notice them if I didn't point them out? Probably not. My guests didn't. But I did. Of course I did. I planned the party. One of the things I had planned was Halloween music. I have 4 CD's of Halloween music I wanted to use. I didn't get a chance to play it though because my friend needed to bring her 5 year old. So we played A Nightmare Before Christmas for him instead to keep him occupied while us adults talked. Sometimes you just need to roll with unexpected guests. See that purple arrow down there. How it's pointing to a blank space next to the spider. I wanted to have spider webbing spread all over underneath the table. I think it would have added that extra something and made the big spider look more in his element. Why didn't I do it? It was a last minute thought and have you ever tried to work with that webbing? Tape will hold it in place but not while you're stretching it out making it look all creepy. It just comes loose and pulls away from the spot you attached it to. I had bought cardboard letters to spell out EEK and black glittered them up. As you can see from the arrow, some of the glitter didn't stick as well. Disappointing to me because I wanted the letters to be heavy on the black glitter. Would you have noticed if I didn't point it out? Probably not. But I noticed. 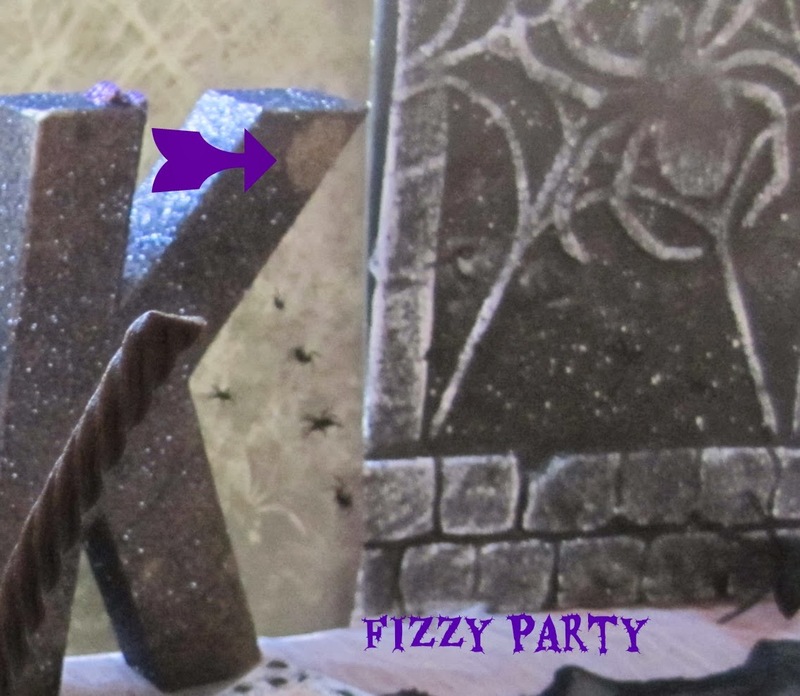 Next time I make glittered letters I'll know to really be heavy with the glitter. The gap. Not a big party foul but it would have looked better without it. Had this been a big party with lots of guests I would have had a lot more peanut butter chocolates there and the gap wouldn't have been seen. I'm torn about the pumpkin bread. I enjoy baking and when fall hits, I especially like making pumpkin bread. I had intended to make some for the party but my husband bought some at Great Harvest Bread Company . He BOUGHT pumpkin bread! I was emotionally torn. Part of me was a little upset. I was thinking, how could you buy pumpkin bread. It's so easy to make and homemade tastes so good. I love to put walnuts in my bread. Another part of me was thinking, this just saved me some time. Plus Great Harvest does use good healthy ingredients and tastes pretty close to homemade. 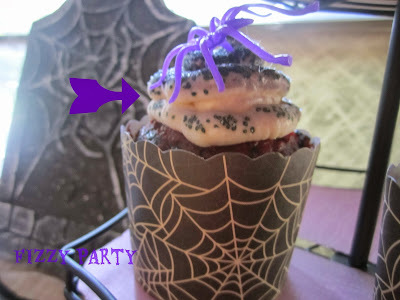 I had this plan to use my Wilton black color mist food color and give the cupcakes an eerie look. However, the black mist didn't adhere to the frosting like I thought it would. I was disappointed in the colour but my friends thought the cupcakes looked great. 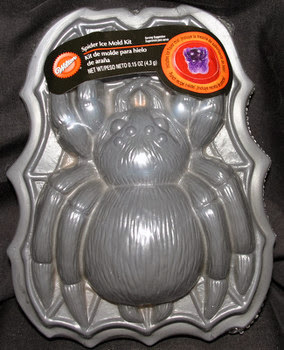 Ahh, the giant spider mold. I got a brain storm the day before the party. Not enough time to do what I wanted to do. 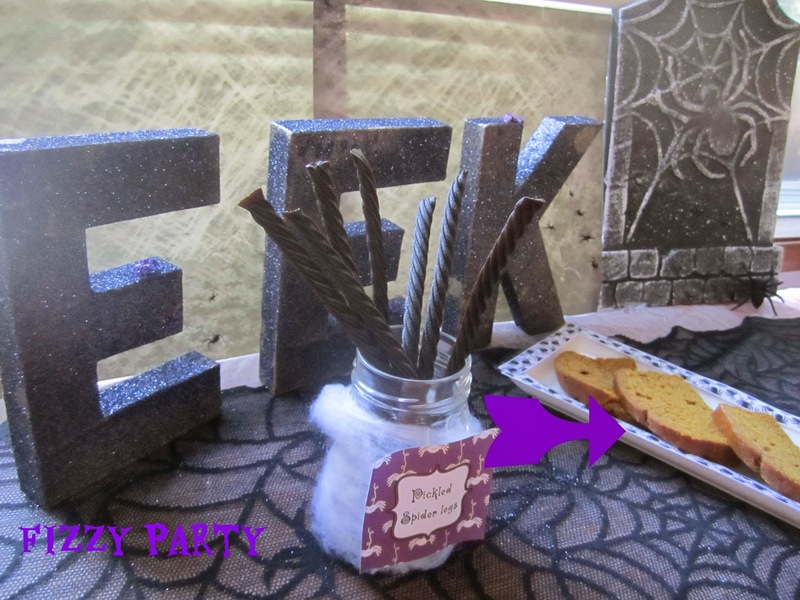 I wanted to make a GIANT bath fizzie spider for all my guests as a party favor. How cool would that be! You could break off a leg anytime you wanted to take a bath. I didn't have enough time because I work a full time job. So I wouldn't have been able to start making the fizzies until 6:00 p.m. Friday night. 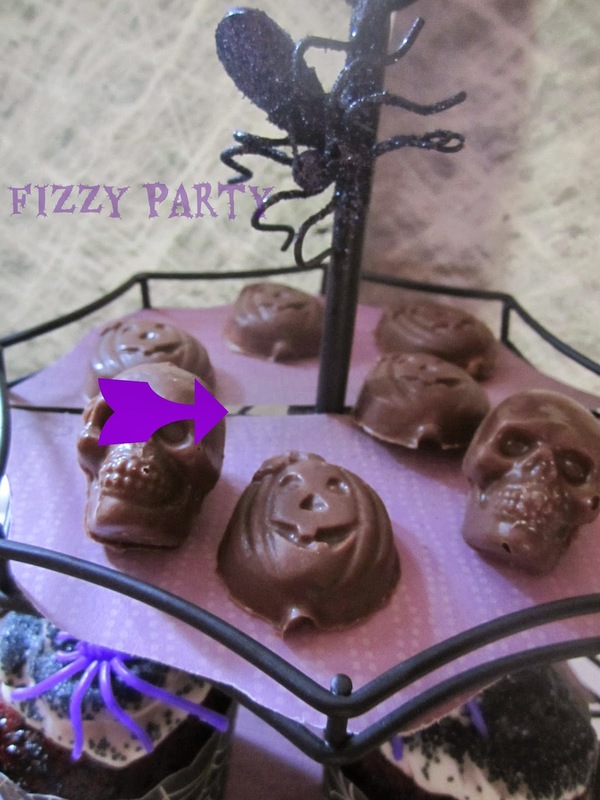 Since I only had one mold it would take me all night and into the morning to make 4 of them and they wouldn't have dried in time. My friends didn't know this was missing because they never knew I had this idea. It would have been a great party favor. I love the look of all those professional cookies. You know the ones. They look like works of art. I wanted to try my hand at them and impress my friends with fabulous cookies on the dessert table. I bought everything I needed. The gels and the luster dust. Than I felt like I was getting the bad cold my boss and co-worker had. They were both out 3.5 days. I took one day off work which made me lose an entire day of party prep. Not having ever decorated cookies all pro like I knew I needed a lot of time to prep. Between taking a day off for the cold and the cookies breaking, I didn't get the cookies made. Lesson learned: Roll out thicker cookies. McGyvering your party is sometimes called for when unexpected events and conditions get in the way of your party prep. And remember, your guests won't know anything's missing. Only you will. Unless of course you told them every party detail ahead of time. Which Of course you didn't. Right? Of course! I's so happy you could come. He was a great guest.